Sea Pine Golf Course (Army Golf Club II) is designed with 6 holes right on the beach so that the bunker really is ‘the beach’. Getting its name from the surrounding pine trees it’s built on a large portion of land and it really is beautiful playing golf right next to the ocean. This course provides a wide range of difficulty levels depending on conditions (on the day), the gameplay on this course can be easy or difficult but either way very fun. 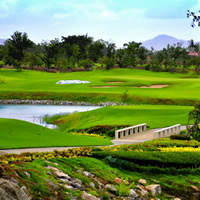 The course is well maintained and the modern clubhouse has fantastic Thai food that you can eat while overlooking the ocean (Gulf of Thailand) and drinking a beer at the end of the day. However one drawback on the course is that army officers and their guest have priority, also they can play up to 5 in a group. So if you get behind one of these groups or your tee times overlap you may be in for a slower game than expected.